I did also try and update some ow sprites with things like the added sprites from pokeyellow, officer jenny, bulbasaur, oddish, and sandshrew, and a bunch of stuff from the space world demo. And in sprites_sets.asm boulder is listed after ball. I'm sure its something elsewhere that's causing the issue but I have no idea where to begin looking for it. All the sprites from SPRITE_BALL and beyond are 4-tile sprites instead of the usual 12 tiles. When a normal 12-tile sprite is loaded for a map, the game calculates the VRAM address to copy the sprite into based on the first available sprite slot. But for the few 4-tiles sprites, it hard codes the VRAM addresses and only allows 2 maximum. So SPRITE_BOULDER ended up overwriting SPRITE_BALL in VRAM. 2. Modify the 'LoadMapSpriteTilePatterns:' routine to allow for more than 2 4-tile sprites. The best way to do this is to modify this code so that it loads a third 4-tile sprite immediately before the first 4-tile sprite in VRAM (overlapping part of the last 12-tile sprite). In this case, you also have to make sure you don't load so many 12-tile sprites that you overwrite the first 4-tile sprite, which will be at an earlier memory address than usual. But with your current list of game objects for this map, this won't be an issue. Just make sure you write the code so that you only use the earliest VRAM address for a 4-tile sprite when it is needed. That way you don't screw up other maps that use the maximum number of 12-tile sprites. I made an attempt at getting this to work. Normal 12-tile sprites are sprites $0 through $9. The two 4-tile sprites are sprites $a and $b. This places a new sprite "$c" at address vSprites + $740 (the last 4 tiles of sprite $9). Then you have to modify the code that calculates the tile number of the sprite data when it's actually needed on screen (when preparing OAM). 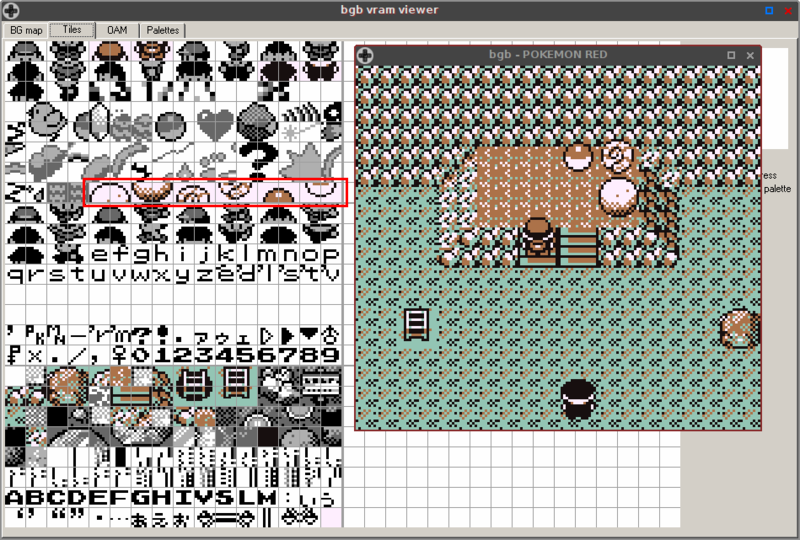 ; Sprites $a and $b have one face (and therefore 4 tiles instead of 12). ; As a result, sprite $b's tile offset is less than normal. Thanks so much! It worked wonderfully. Now I just need to figure out how to arrange the texts in the script file so that the boulder doesn't proclaim "All right. Then this is mine!"